An initiative is helping the women in the Pacific to develop sustainable, formal businesses. Photo credit: ADB. There is a blueprint to overcoming the barriers that limit women's participation in the formal economy. Laws that limit women’s ability to participate in the formal economy and exclude them from starting or running a business do not only bring economic disadvantage to women and their families but also to the society at large. Women in the Pacific, for example, could not own land, register their business, and access lending institutions because of legal and cultural barriers. A multi-pronged approach helped to lower these barriers to Pacific women’s participation in the private sector. The Pacific Private Sector Development Initiative (PSDI) suggested ways on how the business climate can be improved. Legislative reforms that address direct and indirect discrimination are essential as they remove enormous barriers that impinge on women’s autonomy and restrict their ability to engage in business. Before 2014, a married woman seeking to register a business name in the Solomon Islands had to supply the name of her husband. Reforms initiated by PSDI resulted in the removal of this discriminatory provision. In addition, in Samoa, Solomon Islands, Tonga, and Vanuatu, company laws were rewritten to allow “single-person companies.” It means women can now start a company on their own. Those implemented in the Solomon Islands and Samoa made company registration cheaper, faster and simpler. Data on the gender of company directors and shareholders in the former shows a 25% increase in women directors and a 15% increase in women shareholders. Source: Solomon Islands Company Haus. PSDI research in Papua New Guinea revealed that women are not well informed about their rights and are less likely to file business complaints. In 2014, only 20% of complaints were from women compared to 71% from men. To help address this, the project assisted the government to study the impact of competition and consumer laws on men and women, and how regulatory frameworks hinder women’s commercial activities. It evaluated the laws and institutions with regard to the interests of men and women as consumers and examined how laws that protect women consumers are being enforced. It proposed dissemination for information targeting women through women’s associations and non-government organizations and recommended that the regulator adopt a range of complaints processes including the appointment of women complaints investigators. Obtaining loans or credit for business development is a challenge in the Pacific. Limited ownership of collateral in the form of buildings and land, most of which is communally owned under the customary title, makes it difficult for entrepreneurs and businesses to obtain loans and credit from financial institutions. A secured transaction framework was created to allow people to use a variety of assets including personal assets and invoices as collateral for loans. It removed the reliance on land as the main form of collateral and encouraged women to take out loans and financial institutions to lend to women. Source: ADB. June 2015. Promoting Gender Equality and Women’s Empowerment. Consultant’s Report. Manila (TA-6143 REG). P.35. By unlocking the value of the common property, credit is made available to women so that they can start or grow their own businesses. Without the skills and confidence to participate in senior management, women working in the private or public sector were often concentrated in lower-level roles. In the Solomon Islands in 2014, for example, there were 2,788 male company directors compared with just 830 female company directors. Creating a database of potential candidates for senior positions. This improved the social standing and income of women and opened a pipeline of potential new executives and employees. PSDI also introduced a Women’s Business Leadership Program in Tonga, Fiji, and Papua New Guinea to improve women’s knowledge, networks, and confidence to progress to senior positions in businesses. Broader initiatives to ease the constraints of doing business in the Pacific should, wherever possible, include provisions to accommodate women’s specific needs to ensure their equal access and benefit. Meanwhile, dedicated projects are needed to further improve women’s technical and management skills to expand their opportunities in the formal and professional sectors. Asian Development Bank. 2015. 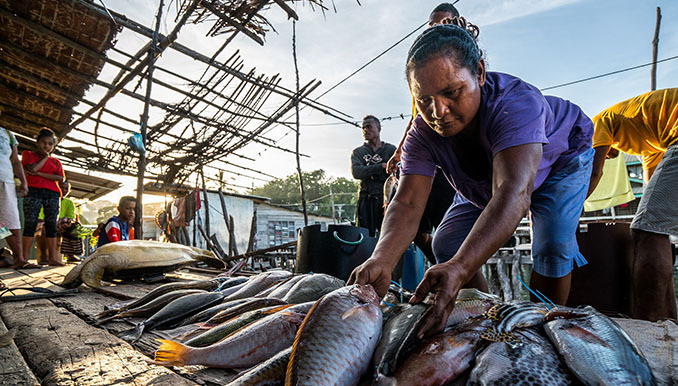 Empowering the Other Half: Women and Private Sector Growth in the Pacific. Mandaluyong. ADB. Unlocking the Economic Potential of Women in the Pacific. ADB. Regional: Pacific Private Sector Development Initiative Phase II. Vijaya Nagarajan is responsible for the gender pilots and programs of the Private Sector Development Initiative. With a PhD from the Australian National University, she has a background in Law and Economics and is a Professor at Macquarie University. She has published widely on gender equity, corporate governance, competition policy, and sustainability. Sign up for our free newsletter and get more of Development Asia delivered to your inbox.